Could and should the EU become more solidaristic? This is a key question for all Europeans. To move beyond superficial answers, we need to clearly spell out the meaning of "EU solidarity" and then tap citizens’ orientations. This volume makes a fundamental step forward in this direction. It distinguishes between fiscal, territorial, welfare and refugee solidarity and finds a surprisingly high popular support for enhancing the "caring" mission of the EU. The authors offer not only an innovative and rich analytical framework but also invigorating signals for all those who have not lost faith in the European project. I believe that the political elites – first and foremost the despondent social democratic parties – underestimate the disposition of their voters to engage themselves for projects reaching beyond narrow self-interest. The fact that this view isn’t just a reflection of unfulfilled philosophical ideals can be seen in the most recent publication by the research group led by Jürgen Gerhards and Holger Lengfeld, who for years has pursued wide-ranging and intelligent comparative studies on solidarity in thirteen EU member states. They have not only found indicators for a shared European identity distinct from national identity, but also an unexpectedly high willingness to support European policies that would imply redistribution across national boundaries. 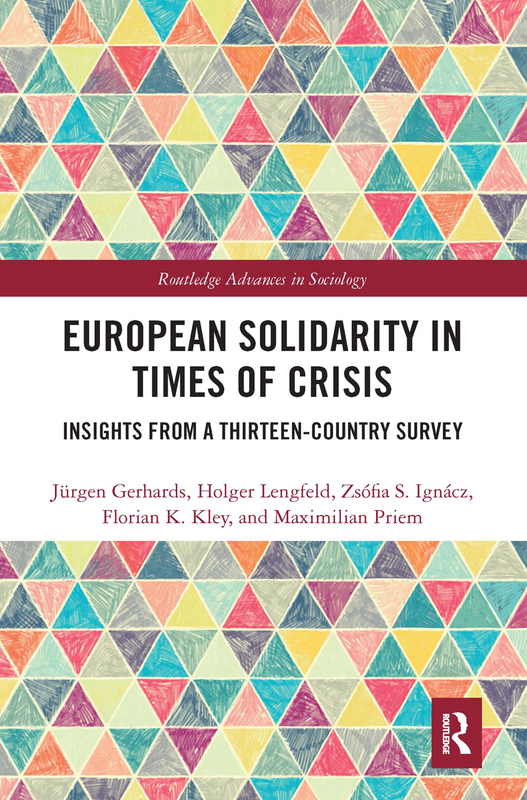 European Solidarity in Times of Crisis is a superb contribution to the literature on the dynamics of social transformation in Europe and to the sociology of the European Union. At a time when nationalist populism is on the rise, it demonstrates that the vast majority of European Union citizens feel a strong sense of obligation toward other Europeans. Through rigorous and reader-friendly empirical analysis of a public opinion survey conducted in thirteen countries, Jürgen Gerhards and his co-authors correct the impression conveyed by the media of a European Union corroded by national egoism. Remarkably, in a time of apparent nationalist renaissance this volume provides us with an optimistic message for European integration – Europe’s citizens are actually much more solidary with citizens of other EU countries than many social scientists and politicians tend to presume. The data from thirteen countries show that Europe is a space of solidarity in terms of sharing wealth, income, and fiscal resources. Even if European solidarity is more problematic in terms of sharing refugees, and even if solidarity might generally be more conditional than these data suggest at first sight, this volume’s message comes at the right time and its importance cannot be overestimated.